It was a fantastic February which finished on a high when Luke made a presentation to a Tourism Springboard event at Pennywell Farm. Wonderful response and some great new supporters were signed up. 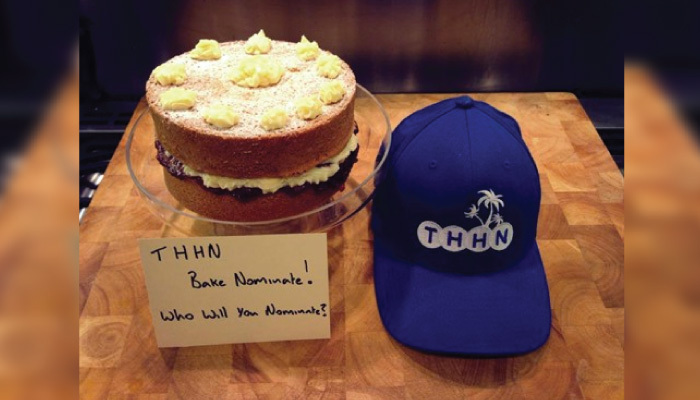 Spring is most definitely in the air and we thought you might be up for a challenge so we’ve got Bake Nominate for you! The idea is that you bake a cake and either sell it to raise money for us or eat it and make a small donation. Then, nominate someone else to better your bake! They then either sell it to raise money for us or eat it and make a small donation. Then, they nominate someone to better their bake and so it goes on…. Tag THHN in all your pics. Post them on Facebook, Twitter or e-mail them to us and, at the end of March, there will be a special prize for the best-looking bake. Please use the hashtag #BakeNominate on all social media posts! Huge thanks go to the lovely Alice Revan and Rosie Fennell for hosting and producing the wonderful Variety Show to raise funds for us on Friday 21 February. This project was entirely their idea, they did all the work and organised the other performers who all took part completely free of charge. The other acts were fantastic juggler, Phil Blackmore, slapstick trio, Three Half Pints, magician Stu Turner and singer and comedienne Tamar Broadbent. Thanks so much to all of them. It was a great night of brilliant entertainment and we all had a ball. Thanks also to Babbacombe Model Village for sponsoring the evening along with the Babbacombe Theatre team for all their support, all the businesses who donated raffle prizes, our photographer Dougie Worthington of Peacock Dreams Photography, our fantastic volunteers and, of course, to everyone who bought a ticket and hopefully had a great night out. We are delighted to report that the evening raised an impressive £1203.30. Wow! Luke is running again! This time it’s a 100-mile trail race starting in London and finishing in Oxford along a path which follows the Thames up river. This all takes place on 3 May with, as you might imagine, some pretty intense training leading up to the event. Luke will be running a minimum of 54 miles a week building up to 80 miles a week! He has a Just Giving page and should any of you wish to sponsor him that would be fantastic. Follow the link to http://www.justgiving.com/Luke-Tillen1 and remember, every penny counts. Thank you! A fantastic charity football match will be taking place at Plainmoor Football Ground on Saturday 10 May, kicking off at midday. The match is being organised by Adam and Michelle Carpenter and is one of a series of matches that they’ve organised in recent years as part of the Gail Bremridge Memorial Cup in memory of Adam’s aunt who sadly passed away in 2009. This year, Adam and Michelle have very kindly offered to raise money us for which we are extremely grateful. The match itself is between a team from the Sportsman’s Arms and the Torquay Legends team which includes Mark Loram and Dean Edwards. Tickets for the match are just £3 each and are now on sale at the Sportsman’s Arms pub on Laburnum Street, the Bombay Express on Belgrave Road, Torre Trophies and Alberts Bar on Belgrave Road. Look out for the Rivera Fringe Festival coming in July, more details to come. Carolanne for running a brilliant sales stand at the Red House Hotel in Torquay and for helping out at the Tourism Springboard event at Pennywell Farm. Riverford Torbay and South Hams, Save on Meats Torquay and Halletts the Bakers for their delicious contributions to the hampers for our families. The Marine Hotel in Paignton who welcomed a family from the Bath CLIC Sargent team. Court Quilters of Torquay who raised £100 by selling their quilting and patchwork. Hotel De La Mer who welcome a family from the Rainbow Trust Children’s Charity. Bear Mountain who have donated the most wonderful Build a Bear Bags for children on THHN holidays. Everyone involved in our Finlake Holiday Caravan which was home this month to a family referred by the Exeter branch of CLIC Sargent. All participants in the wacky pull-up fundraising that’s going on at the moment. Those of you who follow the antics of THHN supporters on Facebook will be familiar with the fit nominations that are currently creating a bit of a stir. People are being nominated to do pull-ups and other fitness challenges to raise money for us. Our good friends at Winners 2000 are all involved and lots of people have been getting sponsorship to do a certain number at a time, great fun! Shamrock Shuffles – a fantastic line dancing group in Sale, Cheshire, who raised £241 for us by putting on a charity display. “Yours in Harmony”, the ladies a-capella group, who have made us their chosen charity for 2014. Everyone at the Pennywell Farm Tourism Springboard event, especially the organisers Chris and Valerie. It was a great day. Lovely atmosphere and lots more people interested in helping us. Ideal. David Hanbury has once again made us the chosen charity for his wonderful Music Festival on the Downs in June, so huge thanks to him. We’ll give you more information as the event draws closer but, for now, get the date in your diary – Sunday 22 June.